Karimov rambled about vegetables and doesn’t think the SCO should get involved in Afghanistan. Karimov seldom leaves Uzbekistan and at 78-years-old is the region’s oldest leader. 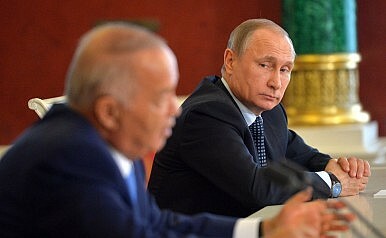 His two-day visit to Moscow resulted in the usual raft of documents–for example, agreements on the export of military products, on cooperation between sports ministries, and on cooperation between Bauman Moscow State Technical University and the Tashkent Institute of Railway Engineering–but the interesting bits are in the press statements made on Tuesday, in which Karimov out-talked Putin (2,611 words to 833, based on the Kremlin’s English-language transcript). Yet, this is both good and bad, a plus and a minus. A minus because not everyone likes it, but a plus because I feel so relieved that I said it. I said something I had spent long evenings and nights pondering, and troubling over sometimes: why have I not done this, why have I chosen a different option, why did the course of events go here and not there, and could I have influenced it all, and so on. So yesterday’s conversation was frank, very frank. What’s kept Karimov up at night? Security in Afghanistan, obviously. Uzbekistan, which currently holds the Shanghai Cooperation Organization presidency, is set to host the SCO summit in June. But as Joshua Kucera points out on Eurasianet, while Karimov and Putin might have both ranked security and cooperating to deal with Afghanistan as top-line issues, they “publicly disagreed on how to do it.” Notably, in their side-by-side remarks Putin mentioned Afghanistan only once, saying “ We are convinced of the need to form a broad anti-terrorist coalition, acting on the basis of international law and under the auspices of the UN, especially with regard to Afghanistan.” In the past, as Kucera comments, Putin has supported the increased involvement of the SCO in Afghanistan. All calculations are made in dollars or in some other units, as it has now become trendy. However, the best possible option, as we became accustomed in our younger days, is to calculate everything in physical volumes, so that we can tell if we are moving forwards or backwards. The message is clear: what you sow today will be reaped sometime later. Does it matter that two new flags will rise in Beijing?